It is our commitment in DePaul's School of Education to help you to develop your full professional potential by providing flexible, high quality programs guided by our conceptual framework: the Urban Professional Multicultural Educator that provides the skills for you to become an effective educational leader. DePaul graduates are among the best prepared leaders in education and are sought by the best employers, not just in Chicago but around the world. Our programs are designed to prepare educators to meet the demands of managing large complex schools in diverse communities and districts. The DePaul student is actively involved in learning, analyzing, discussing, assessing and applying the appropriate body of knowledge for each program. The commitment to multicultural and urban educational values is enriched further by the Vincentian spirit, especially personalism that touches every aspect of the University. DePaul University, with over 100 years of experience providing innovative degree programs for working adults, has taken its commitment to a new level with its online certification programs. Convenient and flexible, our programs let you maintain your quality of life while advancing your career. Our distinguished Type 75 Principals Certification Program will be offered online; providing the high standards set by DePaul's School of Education from the convenience of your office or home. DePaul's innovative technology allows students to fully engage, participate and learn online so that they can develop into successful school administrators. Finally, our online programs are backed by the resources of a well-established urban university. From our online system of libraries to our career services center and network of 125,000 alumni worldwide, you'll have the connections you need. DePaul University is regionally accredited by the North Central Association of Colleges and Schools (30 N. LaSalle Street, Suite 2400, Chicago, IL 60602; 312-263-0456). The School of Education has been accredited by the National Council for the Accreditation of Teacher Education (NCATE) since 1962. All programs are approved by the Illinois State Board of Education. Completely online. You can log in any time, but you must log in consistently at least 4 hours a week. On-campus courses are offered for students in the Chicago land area. DePaul has campuses in downtown Chicago, Naperville, Des Plaines, and Oak Forest. Pentium IV computer running Windows 2000 Professional, XP Home Edition or XP Professional. 512 MB RAM 40 gigabyte hard drive 56K baud dial-up modem, or high speed connection (DSL or cable) CD-ROM drive. Macintosh users must have System 9.2.2 (or higher). Program is completely online and is available to students who are able to fulfill technical requirements. For students in the Chicago area, on-campus courses are offered as additional option. A four day residency is required during each summer that a student is enrolled in the program. Students are required to attend classes on campus to fulfill the mandatory residency requirement. Funding is available from Federal Financial Aid System. 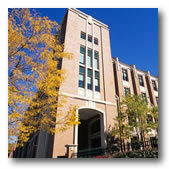 DePaul also offers several payment plans including a program to defer tuition due dates until after grades are issued. Please Request Information to learn more. Submit an application form and speak to an admission representative to get additional questions answered.